Key monsters and NPCs from the Hell's Vengeance Adventure Path come alive on your tabletop with the Hell's Vengeance Pawn Collection, featuring more than 100 creature pawns for use with the Pathfinder Roleplaying Game or any tabletop fantasy RPG! 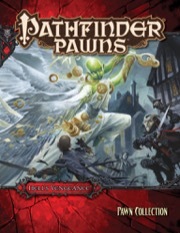 Printed on sturdy cardstock, each pawn presents a beautiful full-color image of a monster or NPC from the Hell's Vengeance campaign, including angels, archons, and knights, and dozens of unique pawns. The Hell's Vengeance Pawn Collection, together with the creatures and characters from the Pathfinder Pawns: Bestiary Box and NPC Codex Box collections, provides pawns for nearly every Hell's Vengeance encounter. Each cardstock pawn slots into a size-appropriate plastic base from any of the Bestiary Box collections, making the pawns easy to mix with traditional metal or plastic miniatures. 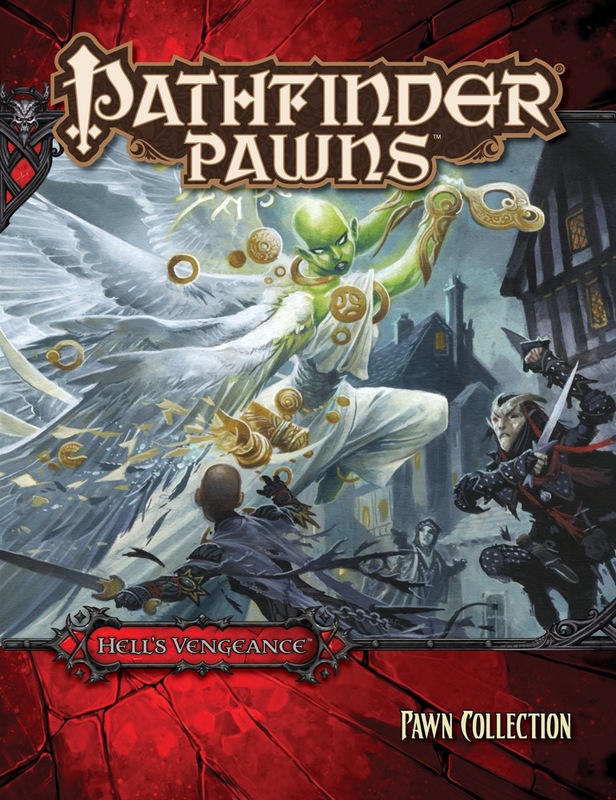 With tons of distinct images, the Hell's Vengeance Pawn Collection brings to life the enemies and allies from all six adventures of the Hell's Vengeance Adventure Path. This set has been extremely useful for my Way of the Wicked campaign. So much so that I have been thinking of getting a second set. Considering how few miniatures of good-aligned creature are out there, this one will be a real godsend for GMs running this AP. I hope the 6 evil Iconics are included. I'm assuming it would, Marco. Will it have Razelago's silhouette. Updated with final product image, description, and set list! As this AP has been the worst of all of them, my interest in this Pawn collection is zero. What about the planetar, Aveshiel? Wasn't they the Glorious Reclamation’s strongest celestial supporter? It's a shame that they didn't get illustrated, so I was hopping Aveshiel would make it into the pawn collection, and that they would look just like the one in the cover (my favorite art for a planetar so far). I'm really looking forward to this one. I would love to run Hell's Vengeance (maybe even following my current Hell's Rebels game), but that aside, This has a great variety of small and medium humanoid pawns, which are a great trove of options for PCs and NPCs when I run modules without the benefits of pawn sets.